I received an email while I was away asking a question regarding replacing smocking on a bishop sleeve with a band/cuff. I deleted the email, thinking I would be able to find the comment. Wrong, I couldn't find it. Good news is I remember that the question was asked. Back to the question. It really is quite simple. Remember to click on the photo to enlarge. This is my beleaguered bishop sleeve pattern piece. On the Children's Corner Bishop pattern there are markings for both the neckline gathering rows as well as the lower sleeve gathering rows. These are a guideline. To replace the smocking with a banded sleeve, I normally choose either the level of the top of row of dots (Indicated with a red line below in the photo.) or if I want it a tad longer I use the lowest row. 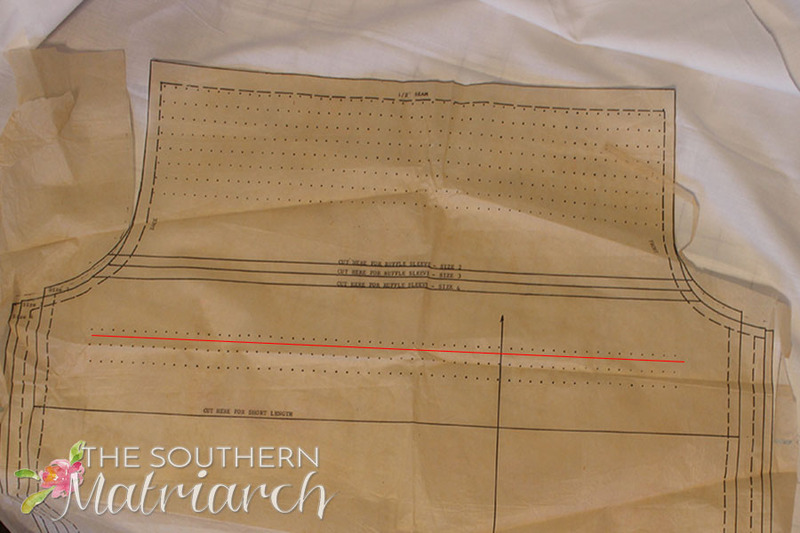 Trace your pattern piece, using your preferred sleeve length, adding a 1/4" seam allowance along the bottom. Cut a sleeve band if your pattern does not include one. It can be on the bias or the straight of grain. I liked the contrast of the gingham on the bias. 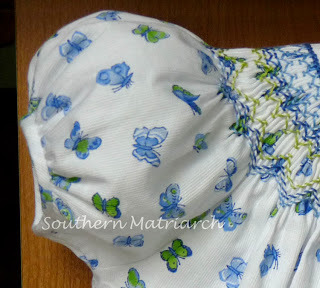 If using a batiste or sheer fabric, I may interface the band piece. On this bishop it appears as if I used a 3/8" finished band. For that finished width, cut your band 1.5" wide. As I said, either on the bias or straight of grain. The length of the arm band will be the child's upper arm circumference plus 1.5" That length will give you ease plus seam allowances. Here is Princess in the above banded sleeve bishop. 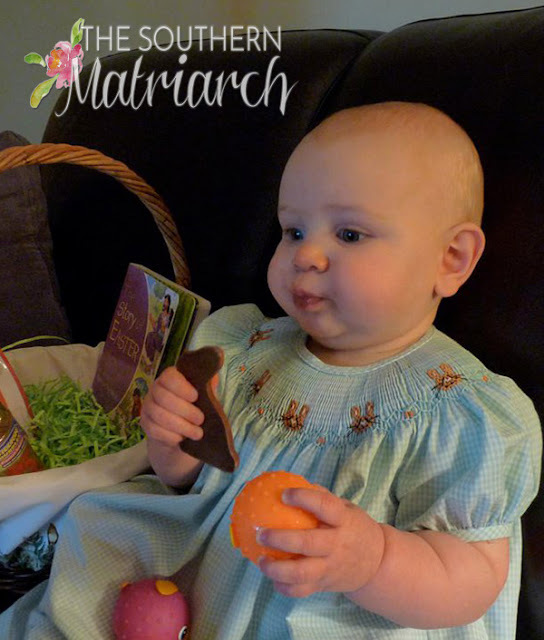 She is nine months old here. I just prefer the smaller, shorter sleeve. 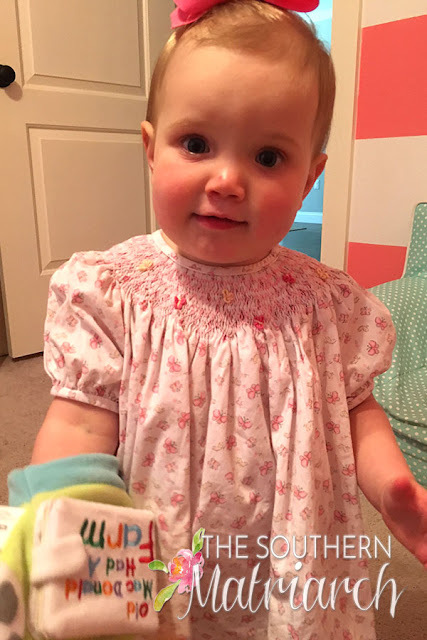 To give equal billing, here is her baby cousin, LG, at 15 months wearing the same pattern. Full disclosure; I didn't make this one, a dear friend did. My babies are so fortunate to have that village who sews for them. I hope this answers your question. 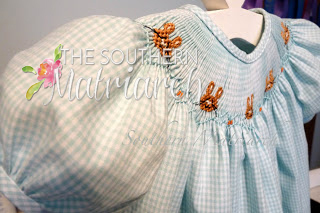 As I said, I prefer this bishop pattern for its sweet sleeve both the smocked and the banded. More of a tailored look which is my wheelhouse and both of my daughters as well. Someone asked what I was working on, all I will say is its cherry picking' time! Pics soon. 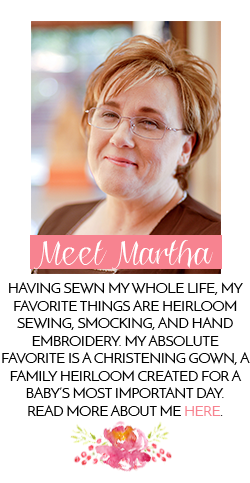 Thank you Martha! I have been trying to figure out why my bishops are too full in the sleeve! Now I see why! Will add notes to the next go around!! Have a cherrio good time! !